She knew the place of beauty in art is a tricky one. It is easy to be dismissive of works that are beautiful as being not sufficiently deep. In the world of high art, if a work did not come with an incomprehensible paragraph describing what it was trying to do, it was not serious. To be the maker of beautiful things was not enough. The equivalent in the world of fiction, which I inhabited, was to be labelled a “good storyteller”. So we exchanged a fair number of rueful, heartfelt notes on this subject. The first half of last year, Manisha was thinking constantly and feverishly about what she wanted to do. She was getting ready for a major exhibition with former students of the Golden Bridge Studio, Pondicherry, where she too had learned much of her ceramics. Like any student worth her salt (or clay), she had grown away from her training and created a language of her own. She worried about how her work would sit beside those of her peers and teachers. 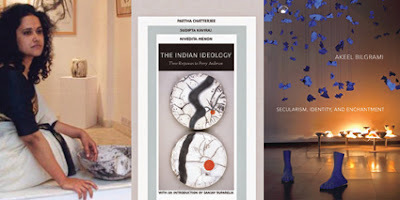 Two of Manisha’s ceramic installations are on the covers of books published by Permanent Black. Although artists are extremely protective about their work, she did nothing to dominate the designing of the covers. She knew how suffocating it is to have anyone breathing down your neck when you’re trying to make something. “You have complete freedom,” she wrote, reminding me only that “There is the plug and wire showing on the left side of the image, can you Photoshop it out?” As we looked at photographs of her works, she remembered how deeply she had been involved in photography, like her oldest brother. It made her dream up a new kind of installation, combining ceramics and photographs. That was what she would do next, she said. 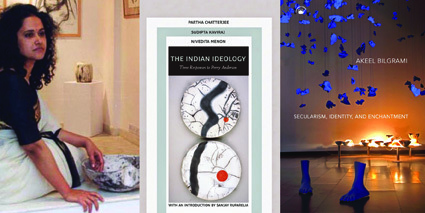 It was when I was working on those book covers that I realised how complex and intriguing her ceramics were. They were, in fact, full of meaning. They spoke without words of the themes in those books. If Manisha was aware of this she did not say so. She was an outlier in many ways and her lack of pretentiousness, so unusual in the world of art, is embodied in these works. They remind me of Sheila Dhar quoting the Queen of Tonga’s profound words: “I just Be-s.” Manisha’s exquisite seed-pod bowls and her folds of porcelain that look like shells or waves: they just Be-s.